The 65m² bungalow for max. 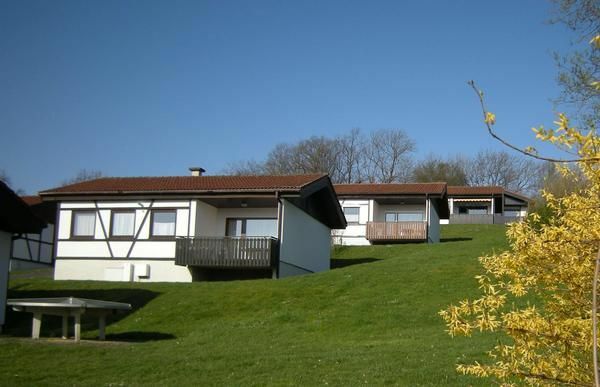 6 people with 2 separate bedrooms, a living room with sofa bed and separate kitchen, as well as a bathroom, is located in the holiday resort Rhön Residence. From the southeast balcony you have a magnificent view to the basalt peaks of the Rhön. At Hotel Rhön Residence you can enjoy breakfast, lunch or dinner buffet. You can also use the large swimming pool, sauna, bowling alley or minigolf for a small deposit. Final cleaning: once per object Costs amounting to 35 EUR (Mandatory). Pet: per object and day Costs amounting to 8 EUR (Mandatory). Gerieflijke bungalow op zeer rustig park. De bungalow is een beetje gedateerd, vooral het kookgedeelte is erg summier met 2 pitten. Verder was alles goed voorzien en schoon. De ligging is prima en de omgeving prachtig. Linen (per person per week, according to consumption 10 EUR). Towels (per person per week, according to consumption 10 EUR).